Career criminal Joe has his life turned upside down following his daughter Gemma’s unexpected suicide. Holding his cousin Adam responsible for his daughter’s untimely death, Joe travels to Adam with annihilation on his mind. However, upon arrival, Joe is told of his wife’s gruesome murder and due to their rocky relationship as well as some damning evidence, Joe is believed to be a prime suspect. Pleading his innocence, can Joe clear his name? And what did Gemma write in her diary prior to her death seemingly damning her father? After a rather lackluster September, I decided I need to turn to crime fiction to cleanse my reading pallet ahead of a month of horror novels. Luckily, I had a few Hardcase Crime novels sitting on my bookcase that I had picked up over the past few years from used book shops. Given it won the Edgar Award in 2005, Kiss Her Goodbye was an easy choice to sink my teeth into. Having published well over one hundred novels since its inception in 2005, like all publishers, Hardcase has had some hits and misses. Luckily, Kiss Her Goodbye is one of the good ones. It’s filled to the brim with what makes these throwbacks great; tough characters, gritty settings and dialogue that punctures scenes like a semi-automatic. 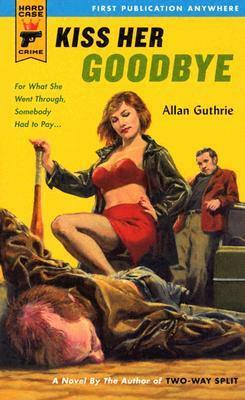 While Guthrie isn’t exactly doing anything new here, he does produce a solid story with hard-hitting, hard boiled elements that left me satisfied at the end of the story. A few weeks ago, I wrote in a review that I was surprised at how easily I figured out the twist in a story (something uncommon for me). The same happened here. I liked what Guthrie was going for by including excerpts from Gemma’s diary, but it didn’t take long to see where he was going with it. That said, it didn’t make the ending any less explosive. Guthrie has some great chops when it comes to writing tension; you could almost feel the electricity in the room during the novel’s final scene. If you’re a fan of noir storytelling, you’ll find Kiss Her Goodbye hits all the marks of the genre. One of Hardcase’s early success stories, Kiss Her Goodbye is a great stand-alone read that should satisfy fans of the publisher’s work.